I learned a few years ago that he's actually crazy intelligent: he has a master's degree in chemical engineering and was awarded a Fulbright scholarship to go to MIT to study. In case you don't know, Fulbrights are awarded to international students, scholars, teachers and the like to come to top US schools to study. A whole slew of Pulitzer prize winners and Nobel prize winners are former Fulbright scholars. So this is kind of a big deal. Dolph TURNED DOWN the Fulbright to get into acting. Wrap your brain around that. Here's what I didn't know until I read this interview in Entertainment Weekly: he quit science because he hooked up with Grace Jones in New York. He was working as a bouncer and got assigned to her one evening and wham! they started dating. She took him to her shoot on the James Bond film, A View To A Kill, and the director was so impressed that he cast Dolph as a KGB henchman. Dolph started taking acting lessons and started auditioning, got the call to meet with Stallone for Rocky IV, got the part, and voila! Huge movie star. I mean, after Rocky the man was He-Man, Master of the Universe. Does it really get any bigger than that in the '80s? Incidentally, during one of the fight scenes, in one take he punched Stallone so hard he actually bruised Stallone's HEART MUSCLE. They had to stop filming for three weeks while Sly recovered. Also? He has an IQ of 160 and he helped invent the water filtration system used by NASA on the space shuttles. 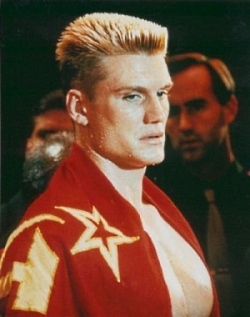 Oh yeah, that's right Dolph Lundgren is an honest to God rocket scientist. Remember THAT the next time you watch Universal Solider. And if you never heard the story about the attempted break-in at his home a few years ago, you should read the EW article. I remember when it happened and that it was awesome. So is the picture I found of him with Grace, you're welcome internets.